Home » Health » What Is Peanut Allergy? Peanut allergy is an allergic reaction that occurs due to the body misinterpreted peanut based foods as one of the dangerous allergens. 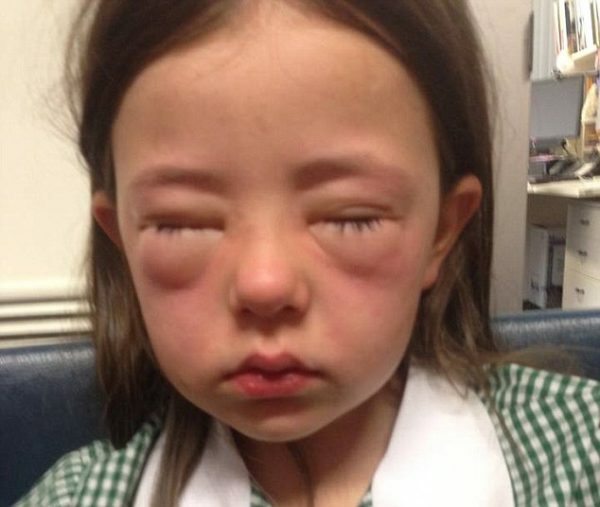 In this condition, the body's defense system will react to fight the allergen and can sometimes give a pretty fatal effect, such as anaphylactic shock. Anaphylactic shock is a condition in which blood pressure will decrease drastically and airway will narrow, so that breathing is inhibited. However, not all patients experience this condition. Anyone can have peanut allergies, although most sufferers are children. Immediately see a doctor if you or your child has a nut allergy, either in mild or severe levels. Allergies occur when the body's defense system misinterpret allergens as harmful substances, so the body will produce a chemical compound called histamine into the blood. This histamine can spread and affect various body tissues such as skin, eyes, respiratory tract, nose, lungs, intestines to blood vessels. Peanut allergies are so, that the body recognizes peanut protein as a dangerous substance. Peanut allergies do not always react when a person consumes nuts. There are cases where the patient is very sensitive, causing allergies to inhale the smell of peanuts or touching the nuts directly. Until now, there is no clear reason why this difference in the sensitivity level of each person can occur. Children, and usually begin by the time they are 14 months to 2 years and continue into adulthood. Adults who had been attacked by peanut allergy or other food allergies while still a child. Unlike other allergies, allergies to nuts tend to persist and can not be eliminated or cured. Only about 20% of patients who are able to recover when growing up. People who have a family with a history of peanut allergy or other food allergies. Rashes, itching, to swelling of the skin. Feeling itchy or uncomfortable around the mouth and throat. The throat feels like choking. Swelling of the lips, tongue, and other body parts. Thirty percent of peanut allergy suffer subsequent attacks within 8 hours after the first attack. Immediately see a doctor if you have any symptoms of a nut allergy, either mild or severe, to be handled appropriately and avoid further complications. Initially, the doctor will usually perform a physical test and ask about the food consumed, the duration and frequency of symptoms that appear, until the history of your allergy and family. If it is still unclear whether the allergy you are experiencing is caused by nuts or other foods, your doctor will usually advise patients to perform a food elimination method. In this test, the patient will be asked not to consume the nuts for one or two weeks, then the patient is asked to return to the original diet while taking down all that he consumed. This test is not entirely safe, and should be done according to the instructions of the physician. Blood test. This test is performed to check the levels of antibodies immunoglobulin E (IgE) or levels of allergen antibodies in the body. Skin test. This test is done by placing foods with allergen content suspected to be triggered on the patient's skin and pierced with a needle. If a certain reaction arises, the patient may have nut allergy or intolerance to certain foods. Food test. In this test, the doctor will provide a variety of foods with and without protein nut content. Furthermore, patients will be observed for approximately 30 minutes to see whether or not an allergic reaction occurs. This test is usually performed in a hospital to be treated directly in the event of a severe reaction. Antihistamine drugs, to relieve symptoms of peanut allergy with mild levels. These drugs are usually taken when allergy symptoms begin to appear, or do not intentionally consume food or drink with the content of nuts. Usually, this drug will react within 15-20 minutes after drinking. Epinephrine drugs (adrenaline), to relieve symptoms of severe peanut allergy. This drug is commonly prescribed in the form of pen-shaped injection to quickly react. These drugs should be injected immediately to avoid any worsening symptoms. Because people can get allergic to peanuts anytime, they are strongly advised to take the medicine at all times and tell the people closest to how they are used. To maximize the effect of the drug, make sure the medicine is in good condition and not expired. If the condition worsens, see your doctor immediately or go to the nearest hospital. Currently, there are studies that find that immunotherapy or desentisation can be the best way to restore peanut allergies and other foods. This is done by increasing the body's tolerance of allergens. Although this therapy has been successful in allergic pollen and insect poison patients, it is still being developed to restore food allergy patients (especially peanut allergies) because of the severity and complications that may occur, such as anaphylactic reactions. Check the ingredients composition on the packaging to ensure food or drink is free from the use of peanut protein. Do not eat foods or drinks that you are not sure of. Always ask for foodstuffs used on waiters or sellers when buying food or drink from the outside. Tell your family or your closest friends about your allergies not to be served food or drink with these ingredients. Typical Indonesian, Indian, Thai, Chinese, Mediterranean, African and Mexican foods that may contain peanut protein. Under certain conditions, some products such as shampoos, lotions, and animal foods can also contain bean proteins when produced. Make sure you find out first before buying it. 0 Response to "What Is Peanut Allergy?"